Speaking of Halloween... 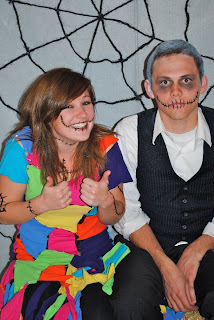 Here we are as Jack and Sally from The Nightmare Before Christmas. He hates dressing up, but he told me that I could do whatever I wanted for costumes. I think this picture pretty effectively sums up our respective feelings about the night. Anyway back to the subject. Michael Everton. My favorite person I have ever met. He makes me happy. He listens to me. He makes me a better person. He puts up with my craziness. He makes me laugh. And he loves me despite my many...oddities. Because of these reasons and so many more, he is what I am most grateful for today. Ps: this is my favorite picture of us. Except for the fact that my pallid skin makes me appear almost Twilight-esque, I love it. And him. girl I had no idea you were dating someone! 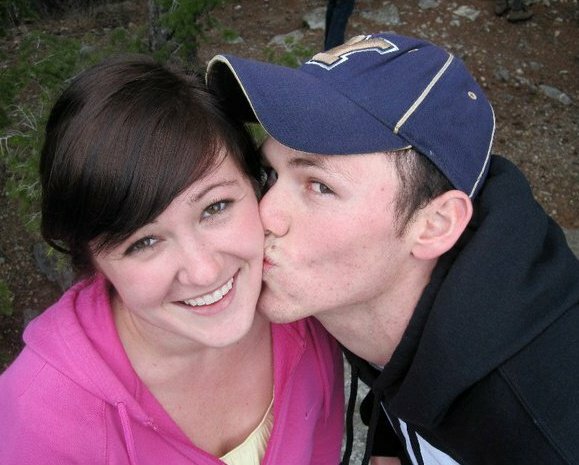 I was a little taken back when I saw a picture of you and some dude kissing you on the face. whaaaat! congrats yo! dani. I love your whole gratitute thing. A) because it means you are grateful, and B) because it means you blog a whole love more. And finally, you mentioned Michael by name. Rather than "cute boy." So fun! I just love happy relationships. Even when they include less than enthusiastic feelings for dressing up on Halloween. I like it. Yay Michael! Also, I'm grateful for your blog because it makes me think of things I forget to be thankful for. Thanks!